Bristolians now have the option of paying for goods and services at over 350 firms in their city with the Bristol Pound. The new scheme, the UK’s largest’s alternative to sterling, aims to boost trade in the local economy. But just how innovative is it for Bristol to have its own banknotes? Not very, if this example from 1867 is anything to go by. Following the birth of the Bank of England in 1694, many provincial banks were set up across England in the 18th and 19th centuries to facilitate a growth in commerce. 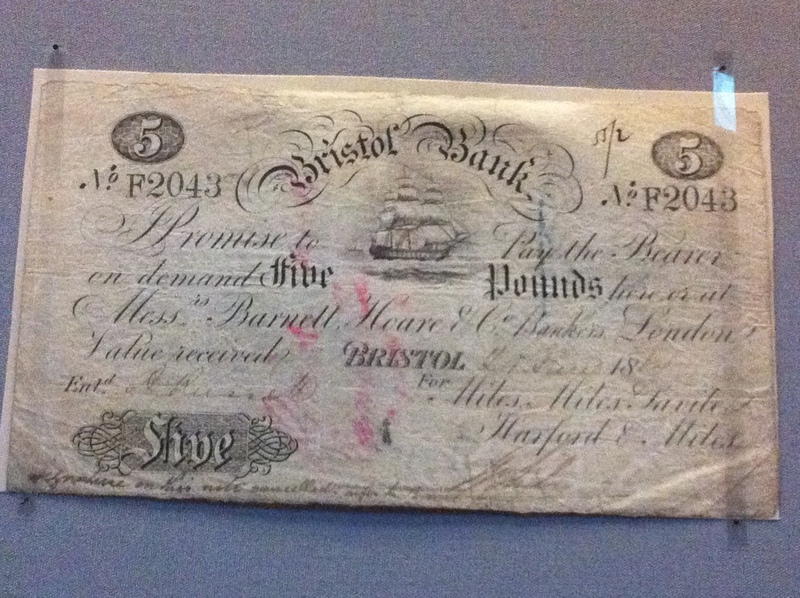 The Bristol Bank, which printed ships on it’s banknotes as a reminder of where the port city’s wealth came from, was instrumental in financing Bristol’s industrial growth and the slave trade. The banknote displayed above is just one of a number of interesting artefacts in the new money gallery at the British Museum, which traces the history of this fascinating subject back to ancient times. We’ve been using coins and other objects for the purposes of trade for thousands of years. But as the Bristol Bank note and other items in the gallery prove there has for a long time been an attempt to keep currency in the local economy. I found it fascinating, for example, seeing coffee house tokens from the 17th century, specific to particular institutions in London and hailing from a time when there was no legal form of small change. Many of these schemes have however been short lived. Whether the Bristol Pound survives in the long term remains to be seen. The fact that you can use it online is key and Bristol City Council is offering to pay it’s staff in the currency. But will it just be seen as a novelty in a few years?